Will Smith, We've Missed You. Men in Black 3, Reviewed. For all of the box-office success and critical acclaim Will Smith has found playing different characters, it's quite possible that Agent J is going to end up being his signature role. Sure, he played Muhammad Ali, but his performance in Men in Black was the one that most defined his strengths—easy charisma, smooth comic timing, infectious nonchalance. Playing opposite craggy Oscar-winner Tommy Lee Jones, Smith wasn't just tweaking his established co-star; it was as if he was announcing that he'd arrived as Hollywood's new biggest star in the world. And why not? Watching Smith in Men in Black, part of the enjoyment was realizing just how right it seemed for him to be the lead in such a hip, fun, cocky summer blockbuster. It was less a movie than a coronation. Maybe that's why 2002's Men in Black II was such a bitter disappointment. Everything that you enjoyed about the first film—Smith and Jones's effortless back-and-forth, the imaginative conceit (taken from the Lowell Cunningham comic book) of a secret organization monitoring extra-terrestrial activity on Earth, the Ghostbusters-like mixture of spectacle and humor—had suddenly lost all its freshness. Men in Black II wasn't just an inferior film—it was a lazy, cynical one, too, something thrown together because everybody involved knew it would make money. All summer movies want to make money, but it's always nicer when they at least act like they're going to entertain us in the process. This wasn't what we hoped for when Smith became a superstar. He seemed cooler than that. 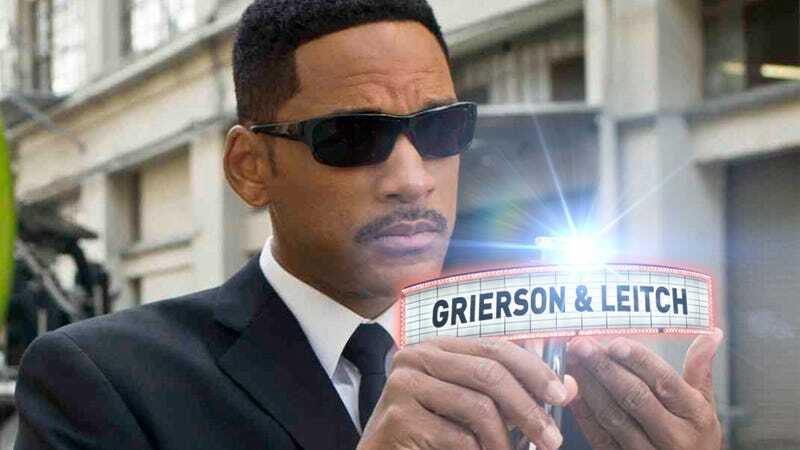 While it's a little thrown together, Men in Black 3 definitely has one thing going for it: The filmmakers seem focused on recapturing not just the style but also the soul of the original. This is all the more impressive considering the amount of behind-the-scenes drama that went into its making. Just about every decision in Men in Black 3 feels like the right one. The new film once again pairs Smith and Jones as Agents J and K. You know the drill: Wise-cracking J is constantly trying to get surly old K to lighten up, but of course it never works. They don't have much time for quips, though, because a powerful alien named Boris (played by Jemaine Clement) has just escaped from a prison on the moon, and he wants revenge against K, who locked him up back in 1969. Boris goes back in time and kills K, which creates a new reality where J is the only person in the present who remembers his partner. So, naturally, J has to go back in time to save K.
Men in Black 3 is bookended by the present-day sequences, but its best moments are in the middle section, when J is in 1969 teaming up with a younger but still tight-lipped K. The character is here played by Josh Brolin, who's basically doing an extended Tommy Lee Jones riff. That ought to be a rather one-note joke, but it turns out to be such a supple, elastic gag that I spent most of Brolin's screen time marveling at how he was doing it. I finally decided that the secret was Brolin's clear affection for Jones's performance and his commitment to replicating not just its mannerisms but also its spiritual essence. Brolin isn't just doing Jones as a younger man; he's also doing Jones as a straight man—the reliably rigid counterpoint to Smith's manic foolishness. Brolin does a rather marvelous job sparring with his co-star. (This helps mitigate some of the creakier "Hey, 1969 was sure different, huh?" gags.) Very cleverly, Men in Black 3 finds a way to freshen up the series's odd-couple pairing: get another actor to substitute for one of them. It's easy to forget that the first, hilarious Men in Black had an emotional undercurrent to it, too: K's reserved manner was actually masking deep-seated regrets for a life he could have had. With a light tough, director Barry Sonnenfeld deftly mixed these disparate moods, and if you don't realize how challenging that was to pull off, watch how badly he did it in Men in Black II. This new film has a poignancy as well, and again Sonnenfeld strikes the right balance. It comes through mostly in a great performance from Michael Stuhlbarg as an alien who has the ability to see lots of different possible futures at the same time, each outcome determined by the slightest difference in individual actions. His character really should be just a plot device to build suspense about how J's trip to the past may affect the present, but happily, Stuhlbarg invests it with a mystical wistfulness. As with the rest of Men in Black 3, his performance carries with it a little something extra, a flourish that suggests the cast and crew actually went to the trouble of trying to make this movie good. It's sad that that's something of a rarity with sequels of this size. But let's not overlook Smith. This is his first film in four years, and while I'm not sure that the world was clamoring for his return in the guise of another Men in Black movie, there's no denying that this role fits him as sharply as the suits his character wears. A little older and a little thicker now—he was only 28 when the first Men in Black came out—the man still has his crack comic timing and effortless gait. No matter his questionable career choices of late, Smith remains as natural an onscreen presence as he always was. Like the Men in Black series, Smith doesn't have as much spring in his step as he once did, and perhaps his glory days are behind him. But it's nice to be reminded why we cared so much in the first place.